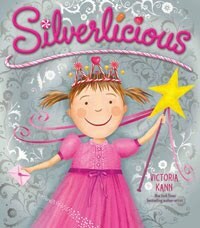 When I purchased a copy of Silverlicious (the newest Pinkalicious book) at the school book fair, I didn't realize it was about a tooth fairy. The shiny silver front cover illustration provides very few clues as to the book's content. The tooth fairy storyline is immediately evident though beginning with page one. Pinkalicious loses her wiggly tooth when she bites into a cookie she stole from her brother. The cookie tastes terrible. She assumes that she didn't lose an ordinary tooth; instead she remarks she has lost her "sweet tooth." She writes a letter to the tooth fairy asking for something sweet to eat until her new tooth grows in. Unfortunately, Tootheetina, her tooth fairy, is very busy and doesn't visit right away. In the meantime the tooth fairy sends Carlos Cupid, Edgar Easter Bunny, and Elf #351 to fill in during her absence. Pinkalicious isn't at all happy with the offerings from the substitutes, and her reaction is certainly not that of a sweet-tempered girl. Finally her tooth fairy visits and leaves a few words of advice along with three "Silverlicious" coins. Silverlicious is predictably enjoyable, and kids that are going through the losing teeth phase will especially appreciate the plot. The letters from the various characters are great fun. My daughter loves the elaborate room decorations the characters leave behind for Pinkalicious. Many of my daughter's friends have started losing their teeth, and she's getting a little anxious about her own teeth. Tooth fairy books are among those most requested in our home lately, so it turns out Silverlicious released at exactly the right moment for our family. Flaunting an equally shimmery cover, April and Esme Tooth Fairies provides a fascinating look into the everyday life of a tooth fairy family. April (age seven) and Esme (age six) are tooth fairy children ready for their first tooth collection mission. When April receives a call on her cell phone from a boy's grandma, the two little fairies convince their parents to allow them to fetch his tooth. It's not an easy mission -- April must use her swimming skills to grab the tooth and the little boy gives them a brief fright. Their parents wait at home, anxious to learn if the nighttime flight was successful. The story starts before the title page so make sure you don't miss the introductory text! This is the first book written by Bob Graham that we've read, and we found his detailed illustrations charming. April and Esme's parents are what some might call "hippie" tooth fairies. Their mom has a tattoo and wears flowers in her hair and their dad wears his hair in a ponytail. The little tooth fairy house is situated next to a tree stump and some mushrooms along a busy urban highway. The teeth hanging like windchimes from the rafters of the fairy house are a little creepy but everything else -- the story, the illustrations -- delight the imagination. We totally loved that the family's dog also has wings! 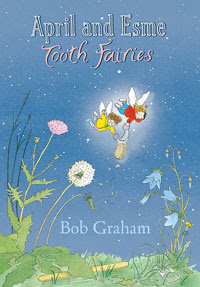 After reading the book, you'll think about tooth fairies in a whole new way. Our search for tooth fairy themed books continues. I came across a few suggestions at Emmy's Book of the Day. Do you have any favorites to share? Also, what kind of gift does the tooth fairy bring to your house in exchange for a tooth? I have a feeling that our tooth fairy will leave a gold $1 coin, but only time will tell. 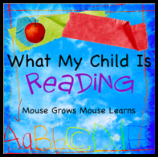 Link up your weekend book posts at What My Child is Reading at Mouse Grows, Mouse Learns, Feed Me Books Friday at Little Sprout Books and/or Kid Konnection at Booking Mama. I like Bob Graham's How to Heal a Broken Wing, so we'll have to look for this one. My son is 6 and has yet to lose a tooth, but he keeps talking about it! We own Silverlicious and like it a lot. We have also read The Night Before the Tooth Fairy by Natasha Wing - it's cute. I vaguely remember borrowing a book when C lost his first tooth, I think it was titled Throw Your Tooth on the Roof. It's about the traditions in other countries when teeth are lost. I have to look for that one again because I can't remember anything else about it and I don't even remember if we liked it! What an informative blog! I will be sure to keep up with your postings. 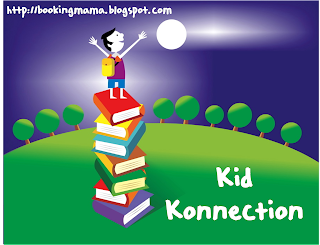 Thanks for sharing a link to Emmy's Book of the Day. We love to share the books we read!!! All the licious books were at the book fair this week. HUGE hits with the little girls! Robert Munch has a great tooth fairy book, too - I forget the title. Kind of like I forget the money for weeks. Sort of ruins the experience. My kids prefer to keep their teeth anyway . . . gulp. I had no idea Silverlicious was about the tooth fairy either! We read Silverlicious in the bookstore, and it was by far Anna's favorite in this series. 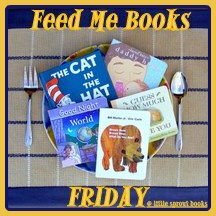 We just read "Dear Tooth Fairy" - it actually made it on our short list of favorite books of the week to be reviewed tomorrow. Thanks for joining WMCIR! I don't know of any tooth fairy books, but No More Gunk by Donna Shepherd is a fun book about dental hygiene. With those permanent teeth coming in it's an opportune time to begin the discussion.